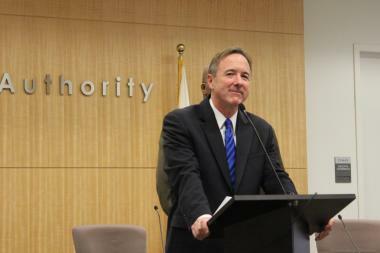 CTA President Forrest Claypool presents his 2013 budget proposal. CHICAGO — Basic CTA fares will remain the same, but the cost of various day passes and rides out of O'Hare International Airport will increase dramatically under the 2013 CTA budget presented Tuesday by President Forrest Claypool. The $1.39 billion budget calls for a $2.75 surcharge on riders using newly bought swipe cards to board at O'Hare, raising the fee to $5. Those using existing CTA passes would continue to pay $2.25, Claypool said. Bus fares throughout the city would remain $2.25. Yet one-, three-, seven- and 30-day passes would all see increases. A one-day pass will go from $5.75 to $10, three-day passes from $14 to $20, seven-day passes from $23 to $28 and 30-day passes from $86 to $100. "Our passes were really the most generous in the country," Claypool said, adding that the new scale brings them in line with the national average for such passes. Claypool said they closed a final $178 million deficit by dividing cuts and increases three ways. The new fare system at O'Hare and on day passes should bring in an extra $56 million. The rest was split in cuts resulting from management reform and new labor contracts. "These changes put the doomsday budgets of the past behind us," Claypool said. "We're moving forward and building a modern CTA on a strong fiscal footing." A tentative agreement was reached Monday with the Amalgamated Transit Union representing bus drivers and train operators and is set to be ratified Tuesday. Claypool said it produced $50 million in savings, largely through a new health-care agreement, even while allowing for 10.25 percent in raises over the next four years. Previous new labor contracts with other unions produced $10 million in savings. Claypool called it "a reasonable labor settlement that worked for everybody." He said the O'Hare surcharge would largely affect tourists, and that even at $5 "it's a tremendous value instead of a $50 or $60 cab ride." Asked if it would undercut the city's ongoing efforts to attract more tourists, Claypool declined to comment.